This beautiful 1950 Studebaker Land Cruiser is owned by Melvin Wampler of Bridgewater, Virginia Melvin is a long time Studebaker Drivers Club member and his Land Cruiser is often seen at various car shows in the area. The 1950 Land Cruiser is perhaps the epitome of the bullet nose Studebaker. At 212 inches in length, the 1950 Land Cruiser was almost 11 inches longer than the equivalent 1951 model. This was the last year that the Land Cruiser was powered by the 245 cubic inch Commander six cylinder engine. The easiest way to quickly tell a Land Cruiser from an ordinary Commander sedan is by the vent windows in the rear doors. Melvin has owned this car for many years and he has improved it over time to the point that is is an outstanding example of the breed. Here is a picture of a Studebaker M Series Pickup from a car show car corral. This very sharp truck appears to be painted in authentic "Forest Green" that was a popular Studebaker truck color in the early post-War period. The M Series, which was introduced in 1940, was the first Studebaker vehicle to resume civilian production after World War II. 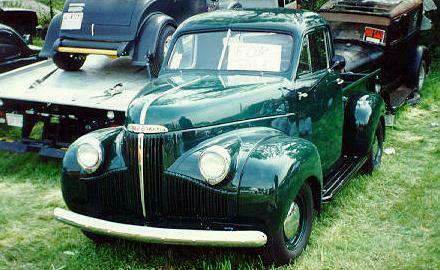 Studebaker also produced a short run of 1946 Champion passenger cars based on a pre-War design. An all new Studebaker passenger car was introduced in 1946 as a 1947 model. The M Series trucks would go on through 1948 until the C Cab truck was introduced as a 1949 model. This Solido of France 1957 Studebaker Silver Hawk Coupe is from my Stude toy collection. The body of this model is diecast, but the roof is plastic. This allowed it to be made with two roof variations, a coupe as shown here, and a hardtop. Silver Hawk hardtops were not sold in the U.S. but were available in export markets. 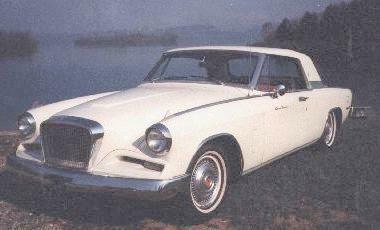 In that I have owned two 1957 Silver Hawks, this is one of my favorite Studebaker toys. VISIT MY NEW STUDEBAKER TOYS HOME PAGE. CLICK HERE TO BUY STUDEBAKER TOYS.